I am Ravi Sinha and I am a rising junior at the Middlesex County Academy for Science, Mathematics and Engineering Technologies in Edison, New Jersey. At school, I study electrical and computer engineering. My exposure to programming has allowed me to realize that I wish to pursue computer science as a major alongside physics, which I also enjoy a lot. Math is a lot of fun for me, and I enjoy challenging myself by trying to figure out different problems using skills learned in engineering. Outside of the Academy, I like to hang out with my friends, play video games, listen to music, and watch Game of Thrones! I am also on a robotics team in FTC, and prefer to write the software for the robot that we build. I'm the kind of guy that likes to mess around with something to see what happens—within reason, obviously. 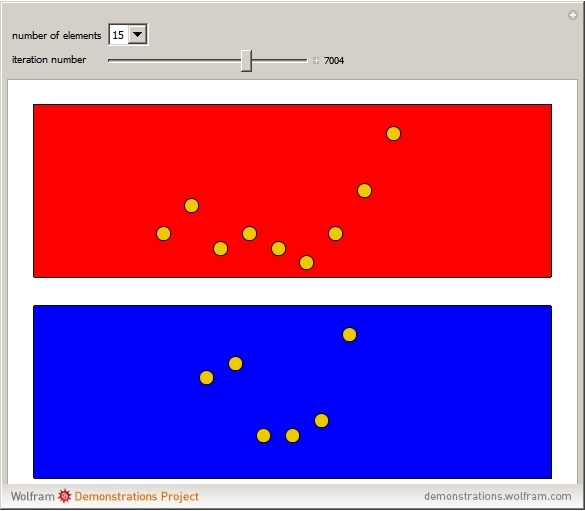 This program allows for users to simulate the Poincaré recurrence theorem, which states that, given infinite time, at some point an almost exact replica of a previous state of a system will be reached. The program shows a binary model which contains only two possible states as opposed to many states in order to reduce computation time. The user can cycle through each iteration to see the transition of elements (represented as disks) between the two states. There is a 100,000-iteration cap and a 15-element cap to the program to ensure that the calculations do not take more than a few seconds to perform.